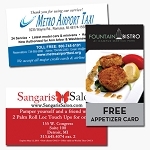 Full color business cards printed on 12pt C2S and ready the next business day. Orders must be placed, with press ready art, by 11am EST to qualify for Next Day production. Weekends or holidays do not count in production time. Orders will ship the next business day.